The 3 Sprouts Water Bottle is a must have for your child’s lunch bag. Made from Tritan, a high-quality plastic, each water bottle holds up to 12 fluid ounces and is odour, stain and scratch resistant. The soft silicone drinking spout flips up and is easily accessible for younger children. 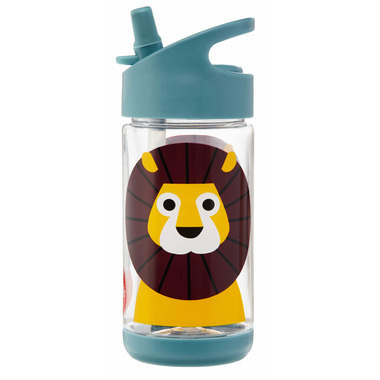 Lead-free, BPA-free, phthalate-free and non-toxic, the 3 Sprouts Water Bottle is perfect for ages 3+. Dishwasher safe. Before each use always clean and inspect the product. Throw away at the first sign of damage or weakness. Use with adult supervision. Avoid filling with carbonated liquids or pulp juices. Not microwavable. Dishwasher safe, top rack only. Not overly impressed although I usually love this brand. Water got stuck between the bottom coloured plastic part and the bottle and the spout has cracked, it also isn't super easy for my son to drink out of.